Remember Areal? It was the domed Kickstarter project from West Games; a team supposedly made up of members who worked on S.T.A.L.K.E.R. The project went through a turbulent fundraising period and was eventually pulled. But that hasn’t stopped West Games from dreaming the dream. They’re back, this time with a game pitch that’s even closer to nabbing them a copyright infringement ticket than ever before. 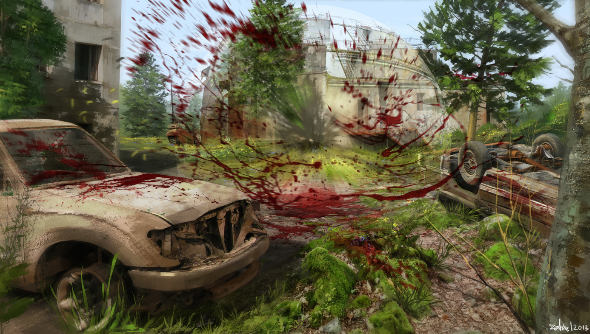 Take a look at STALKER Apocalypse. STALKER Apocalypse absolutely isn’t S.T.A.L.K.E.R. For a start, it doesn’t have all those absurd full-stops in it. “We have registered a trademark for Stalker Apocalypse, and have every right to use it as our title. Stalker by itself is a common word, and anyone can use it,” states the crowdfunding campaign page. It does feature “plenty of familiar elements that will undoubtedly please fans” though. It’s set in a filthy post-apocalyptic world, where anomalies rip apart reality and bend physics. The areas that they affect are scouted by scavengers known as Stalkers, who are looking for artifacts with interesting abilities. Their scouting adventures are likely to be made a little difficult by the ramaging mutant creatures, though. So it’s pretty much the same game as S.T.A.L.K.E.R then, and also an exceptionally similar pitch to Areal. Despite hitting its Kickstarter funding goal (thanks to an odd cash injection of $20,000 at the last minute), Areal was accused of misinforming backers of West Game’s link to the original S.T.A.L.K.E.R games by Vostok, another studio made up of ex-S.T.A.L.K.E.R devs. There was also the bizarre case of Russian President Vladimir Putin offering his support for the project in a letter. Areal was pulled from Kickstarter thanks to all this controversy, and it looks like West Games may not be welcome back there. The campaign for STALKER Apocalypse has been made with World Wide Funder. There they’re asking for $600,000 between now and March 12th 2015. As of writing, they’ve nabbed $150. So, how long before this project descends into controversy?